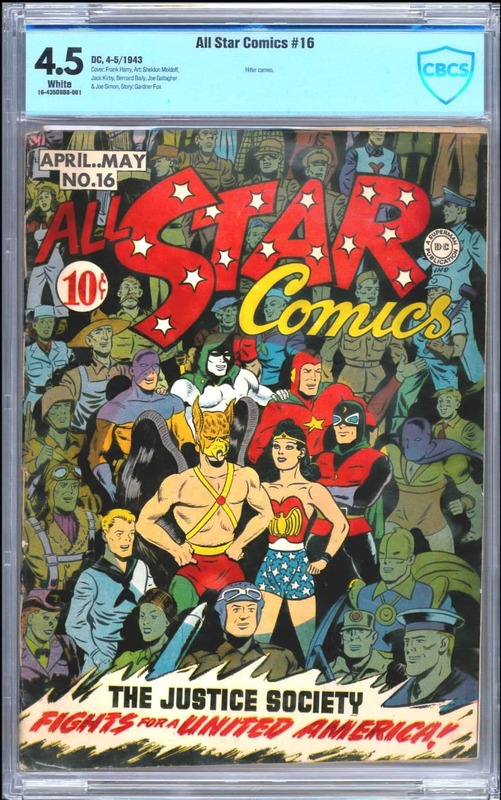 The Justice Society of America (JSA) on this beautiful copy of All Star Comics #16* is drawn by Frank Harry and features nine members: The Sandman (Wesley Dodds); The Spectre (Jim Corrigan); Starman (Ted Knight); Dr. Mid-Nite (Dr. Charles McNider); Wonder Woman (Diana Prince); Johnny Thunder; Hawkman (Carter Hall); The Atom (Al Pratt); and Dr. 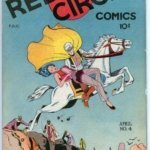 Fate (Kent Nelson). 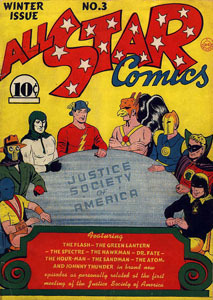 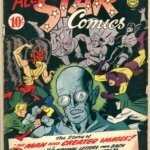 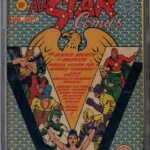 The JSA first appeared in All Star Comics #3 (Winter 1940–1941). 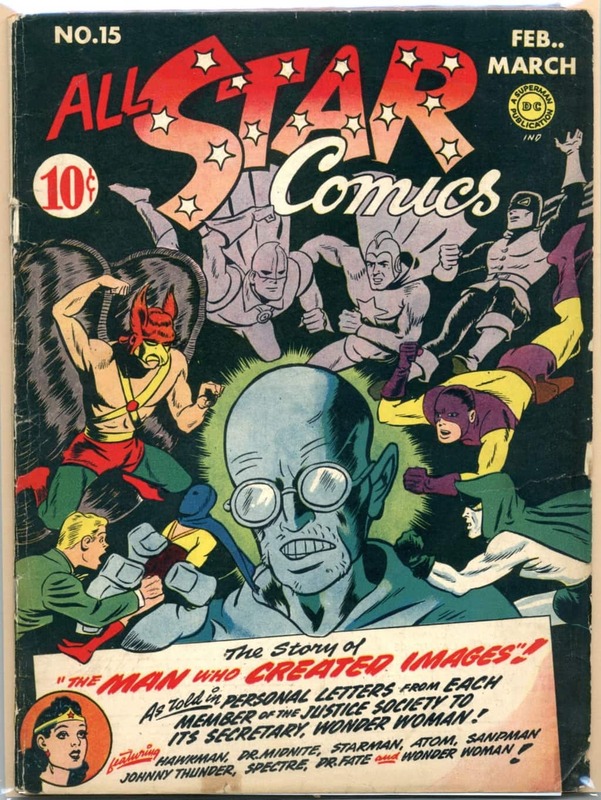 It was Gardner F. Fox’s innovation to make the first team of comic book superheroes. 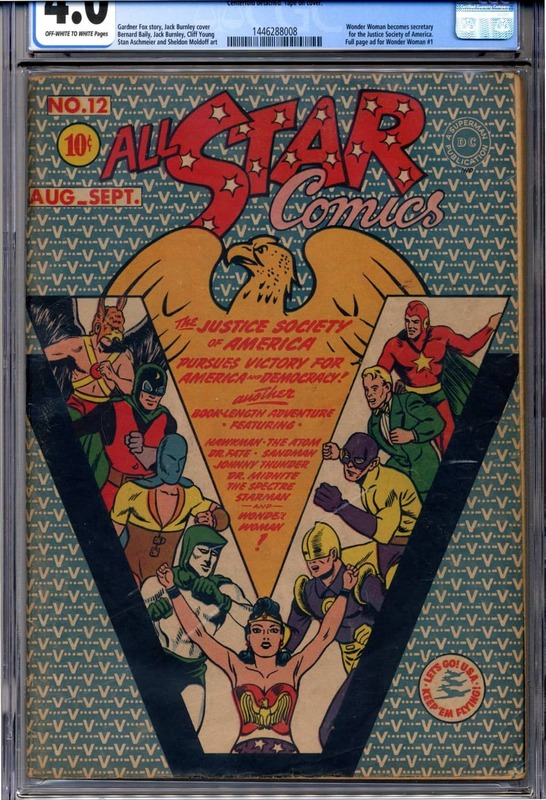 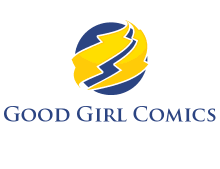 The series developed a custom that whenever a member received his or her own title, that character would leave All Star Comics, and as such remained an “honorary member” of the JSA. 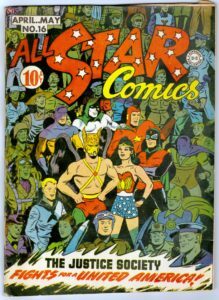 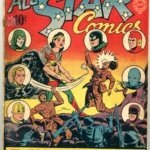 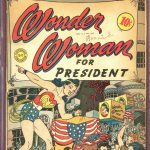 The exception (kind of) was Wonder Woman who made her first appearance ever in All Star Comics #8 (Dec. 1941-Jan. 1942). 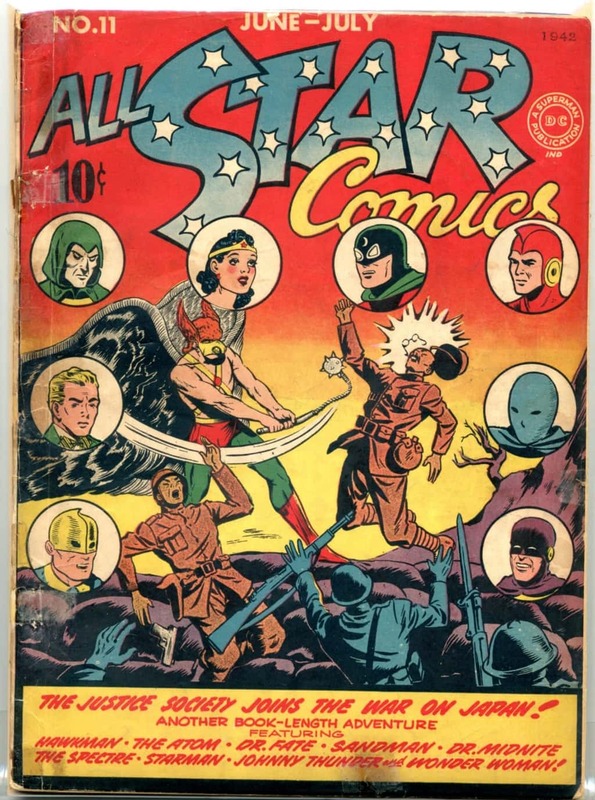 Presumably she was allowed to carry on in All Star Comics while running in her own title because she was serving as the JSA’s secretary. 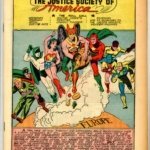 Superman and Batman, having already had their own established titles at the time, started as “honorary” members from the beginning. 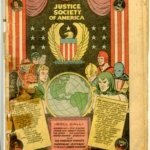 A back story of how Superman and Batman originally founded the JSA was created in DC Special #29 in 1977, and is heavily featured in the recent Superman vs Batman: Dawn of Justice movie. 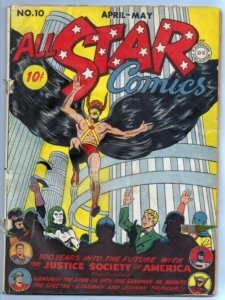 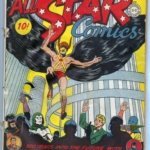 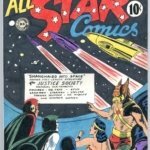 All Star Comics and the JSA’s adventures ended with issue #57 February-March 1951, near the end of the Golden Age of comics. 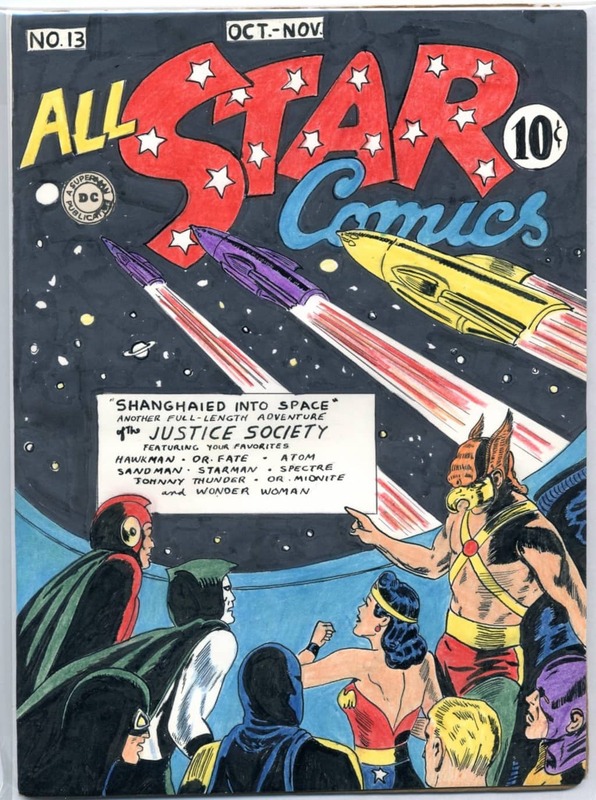 Inside All Star Comics #16* is an eight chapter story, complete with introduction and conclusion. 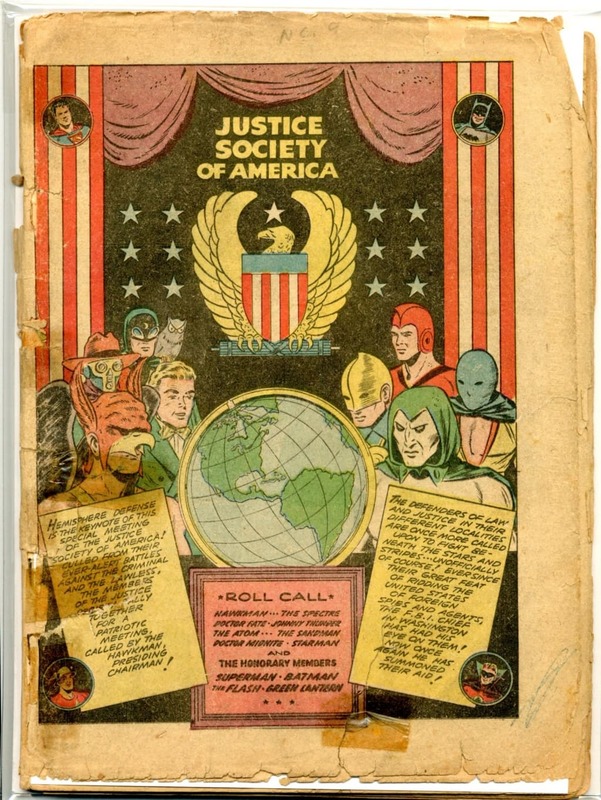 The JSA gather at a movie theater to talk to the American people about what the evil Axis are attempting to do and ask for their help in ending racial and religious prejudices. 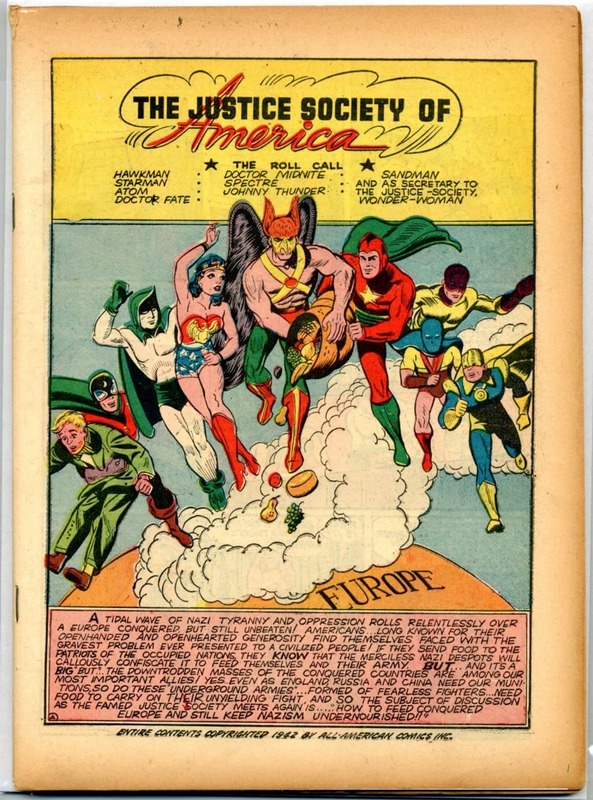 As Hawkman says, “we are ALL Americans, regardless of race, creed or religion, and the enemies are Hitler, Mussolini and Tojo, and together we can defeat that enemy!” Pretty good message from 73 years ago that we can still heed and gather inspiration from today. 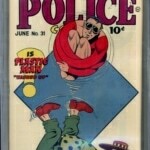 I’ve put together a “min-run” of issues #9* to #16*, shown below (#9, #13 and #14 are cover-less) . 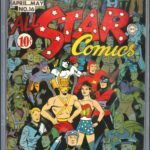 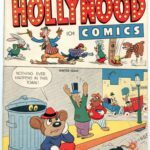 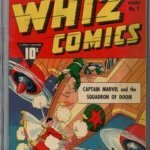 Numbers #11*, #13* and #15* are from the Raymond Miller collection, a Fanzine Writer & Artist who was also known for amateur restoration of comics in a Pop Hollinger manner.